It's Never Too Early to Teach Your Kids Spanish! My daughters can spend endless hours in front of the TV…if I let them! So, when they are watching a movie or a TV show, I like to choose educational programs so they might learn a little something. Not all educational programs are fun and entertaining enough to keep my girls focused, so when I was asked to review Spanish For Children by the Bilingual Fun Company, I knew my girls would be great test subjects! I have a 2 1/2 year old and a 5 year old that are very curious and very eager to learn. The three of us sat down to watch the videos. I was sent Volume 1 which goes over colors, numbers and animals and Volume 2 which covers greetings, body parts and food. I’ll tell you what…not only were these videos entertaining for my girls, but I really enjoyed them too! My girls actually wanted to watch them again as soon as they were over and guess what! I let them! We seriously really enjoyed these videos and I plan on watching them over and over with the girls. I also liked that there was a quiz at the end. We were shouting out the answers trying to see who could get the answer first. 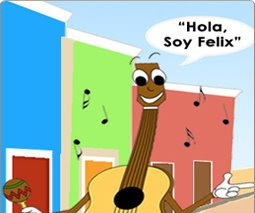 Find the Spanish for Children collection at Bilingual Fun. These would make great Easter Basket goodies! Detroit Mommies is Overjoyed With Excitement to Meet Katie Couric! That sounds great! My daughter learned a lot of SPanish through Dora!